Vinayak Industries - Why Us? Being a front-runner in the industry, we are trusted with the task of supplying the best products to the customers worldwide to fulfil the demanding requirements of the processing equipment. Our manufacturing process is executed under the watchful eyes of the experts. The whole process is sectionalized into different divisions. Each division is appointed for a distinct purpose to ensure consistency. For moving from one division to another, the product is required to fulfil the prescribed norms of the one in question. It's only when a set of products has gone through all of them that a cycle is considered over. The cycle encompasses the whole spectrum, from a reception of raw materials to final segregation and packaging. This makes our products completely error free and manufactured to the exact specifications. Having an insight into all the operations, we have streamlined our production processes. This saves both, the product costs as well as the manufacturing time. Our knowledge and experience advantage is passed on to the customers in form significant cost savings through competitive prices, as compared to other players in the market. Our infrastructure lends support to every section of our business and facilitates the production process for equipment as per the customer's specifications. 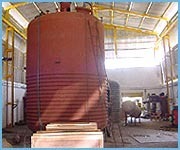 We have full-fledged workshop having all the latest machinery and equipment. The infrastructural facility at shop floor levels is supported by quality control measures also. We have a collection of modern gadgetry that is constantly kept under the vigilance of the technicians to appraise their performance. Alongside, we have a team of highly trained workers. The entire force has been separated into a hierarchical pattern for better efficiency. They are also trained on a regular basis to polish their skills as well as to be abreast with the changes in industry practices as well as customer demands. Quick Shipment of our stock. Packing and shipment as per your request. Our commitment to quality, innovation and technology has made us a name to reckon with.